I always enjoy reading books about people decluttering and getting rid of their stuff. Then books like this usually inspire to take a look at areas in my home and life where I could declutter. I get a bit of a high when it’s time to declutter! This book has been on my TBR list for only a few months, and I saw it on display at my library and decided to read it now. And, bonus, I was surprised to find out that the author is Canadian so I can use it for the Canadian Book Challenge for this year! Yay! “In her late twenties, Cait Flanders found herself stuck in the consumerism cycle that grips so many of us: earn more, buy more, want more, rinse, repeat. Even after she worked her way out of nearly $30,000 of consumer debt, her old habits took hold again. When she realized that nothing she was doing or buying was making her happy—only keeping her from meeting her goals—she decided to set herself a challenge: she would not shop for an entire year. I was impressed with the author keeping track of everything that she got rid of in her house, and at how little she ended up keeping, including her wardrobe. 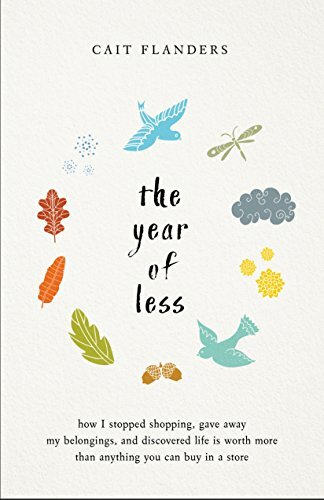 But, as the book shows us, it takes us through her entire year and her thought processes behind why she keeps certain items and why she lets go of others. The book isn’t just about decluttering though (although that’s my favourite part about it). It’s really about her changing her spending habits to actually saving money…which seems rare in this consumerism world that we live in. It makes me stop and think about my spending habits and where I could improve on those…and why I purchase what I do. Very thought-provoking! *My progress for the Canadian Book Challenge is 11/13! !